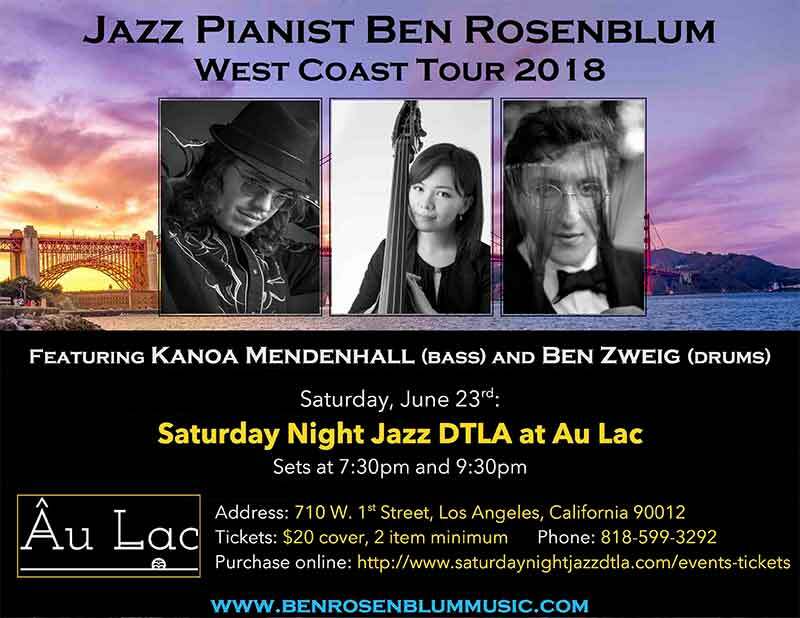 Ben Rosenblum in Los Angeles on Saturday, June 23rd at Au Lac for Cathy Segal-Garcia’s Saturday Night Jazz DTLA series. My name is Ben Rosenblum, and I am a Juilliard-trained jazz pianist based in New York City. Hope all is well! Last year, I debuted my trio on the West Coast to celebrate my first album, Instead (4 stars, Downbeat Magazine), and had well-attended shows at Kuumbwa Jazz Center and Cafe Pink House, among other venues. This June, I’m leading my trio on a return trip to the West Coast from June 9-24th. In particular, I will be in Los Angeles on Saturday, June 23rd at Au Lac for Cathy Segal-Garcia’s Saturday Night Jazz DTLA series. I was wondering if you might be interested in helping to publicize the concert through an article or preview about the performance, or whether you might want to attend and review the show. Here is a link to listen to my debut album: https://soundcloud.com/user-3700989/sets/instead/s-XG1Un. Let me know if you would like me to send a physical copy as well. You can learn more about me at www.benrosenblummusic.com/about, Lastly, you can read an article about my trio, written during our most recent tour of the Midwest. Let me know if you need anything else from me, and thank you so much for your time and consideration.